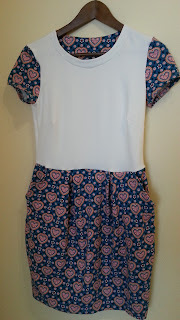 DodeBag: Sweatkleid "Bella" and "Chloe"
I made a dress for my youngest daughter for her sisters' primary "graduation". 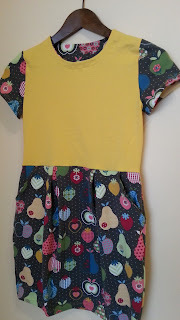 I combined it with plain yellow fabric and grey fruity jersey. Next is my eldest daughters dress and of course it is for her "graduation". 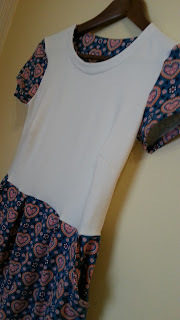 A plain white jersey paired it with a decorative heart jersey fabrics. Both dresses are pattern of www.pattydoo.de. 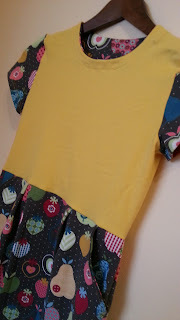 These are the existing jersey fabrics that I have because I used these also to their other clothing. Both are from my stash and bought at stoffenspektakel.